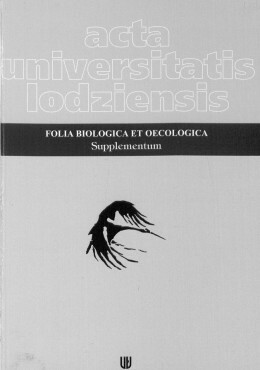 Folia Biologica et Oecologica is a journal issued by the Faculty of Biology and Environmental Protection of the University of Lodz. Since 2012, Folia Biologica et Oecologica https://content.sciendo.com/view/journals/fobio/fobio-overview.xml, has been published by an international editorial office exclusively on line in an open access scientific content formula, Versita, that guaranties wider distribution as well as easy access to its articles http://versita.com/. Folia Biologica et Oecologica publishes original and innovative research papers on all aspects of biology and ecology especially in the field of zoology, hydrobiology, botany, microbiology, biochemistry, biophysics, physiology, behaviour, and evolutionary biology. Folia Biologica et Oecologica publishes standard papers but also longer papers such as review articles that sum up the current state of the research on a particular and important topic. Manuscripts should be written in English and conform to the guidelines below. Authors whose first language is not English may count on our assistance in getting their papers ready for publication; however, meticulous proofreading and editing is expected before the submission of manuscripts. After the manuscript has been preliminarily accepted by the editorial committee, it will be forwarded to referees for peer review. Manuscripts will be published six months from the time of preliminary acceptance. General. All papers must be in English. Use as little formatting as possible (Avoid the use of parenthetical comments and italics or bold for emphasis.). Use a 12-point font (preferably Times New Roman or Arial). Separate paragraphs with a blank line. Avoid footnotes in the body text of the manuscript. Set the page to obtain 30 lines per page. The text should be 1.5 spaced. All decimal fractions are indicated by the period (e.g. 1.5). Title page: This should include the title, list of authors names, institute or laboratory of origin, name, postal address and email address of the author to whom proofs should be sent, an abbreviated title for use as a running head line and three-five keywords, which should be relevant for literature searching and each normally comprising not more than two words. The basis of life history plasticity in the tropical butterfly Hypolimnas bolina (L.) (Lepidoptera: Nymphalidae). The name(s) of all authors of the paper must be given and should be typed using capital letters (e.g. Adam Smith, Brian Smith & Carol Smith). E-mail address(es) should be provided but only for corresponding author. The abstract should be concise and informative (approximately 100-200 words). The abstract should be followed by a list of key words that are not present in the title (3 – 5 words). The arrangement of the main text varies with different types of papers but should usually start with anintroduction and end with a list of references. The body text should be subdivided into different sections with appropriate headings. Where possible, the following standard headings should be used: Introduction, Methods, Results, Discussion. Conclusions, Acknowledgements, References. These headings need to be on a separate line and start with a first capital letter. Please do not number headings or subheadings. Titles of journals should not be abbreviated. Unpublished material, except for PhD theses and “accepted papers”, should not be included among the references, but should be cited as ‚C. Smith, unpubl. data’ or ‚C. Smith, in press’ in the text. Wright, J.F., Gunn, R.J.M., Winder, J.M., Blackburn, J.H. & Wiggers R. 2001. The response of chalk stream invertebrates to a prolonged drought: the value of a long-term dataset. Verhandlungen der Internationalen Vereinigung fur Theoretische und Angewandte Limnologie, 27: 912–915. Same as above, but ”in press” appears instead the year in parentheses. Sargent, R.C. & Gross, M.R. 1993. William’s principle: an explanation of parental care in teleost fishes. In: Pitcher T.J. (ed. ), Behaviour of Teleost Fishes, 2nd edn, pp. 333–361. Chapman & Hall, London. Shuster, S.M. & Wade, M.J. 2003. Mating Systems and Strategies. Princeton University Press, Princeton. Snowarski, M. 2014. Atlas grzybów Polski (Mushrooms and Fungi of Poland). Available from:http://www.grzyby.pl/index.html. Thoms M.C. 1987. Channel sedimentation within urban gravel-bed rivers. PhD thesis. University of Technology, Loughborough, UK. On the use of dashes: (1) Hyphens are used to link words such as personal names, some prefixes and compound adjectives. (2) En-dash or en-rule is used to link spans. In the context of our journal that means numerals mainly, most frequently sizes, dates and page numbers (e.g. 1977–1981; figs 5–7). All figures should be referenced consecutively in the manuscript; legends should be listed consecutively immediately after the References. For each figure, the following information should be provided: Figure number (in sequence, using Arabic numerals − i.e. Figure 1, 2, 3 etc. ); short title of figure; detailed legend. Small illustrations should be grouped into plates. Illustration should be prepared as JPG or TIFF (please use LZW compression) files with at least resolution of 300dpi. Tables, if any, should be given at the end of the manuscript. Please use the table function in your word processor to build tables so that the cells, rows and columns can remain aligned when font size and width of the table are changed. Please do not use Tab key or space bar to type tables. Please follow the above basic guidelines and check if your manuscript has been prepared according to the style and format of the journal. All authors agree to its submission and the Corresponding author has been authorized by co-authors; 2) This Article has not been published before and is not concurrently being considered for publication elsewhere); 3) This Article does not violate any copyright or other personal proprietary right of any person or entity and it contains no abusive, defamatory, obscene or fraudulent statements, nor any other statements that are unlawful in any way. In submitting the final version of revised manuscript to editors, authors are asked to provide the information about the running title (to be used in footer). Authors need to complete and return an Assignment of Copyright form when paper is accepted for publication.